We have all been there, feeling stuck and getting nowhere. We know that deep within our hearts that we are meant to achieve much more in life and that we are destined to be successful. But when we look at where we are at our lives now, we’re not getting ahead. We’re stuck. If you want to be successful in life, read this article and follow these tips. Launching a business is difficult. The competition is stiff and the odds of success are low. Losing weight is not easy because it takes consistent effort and it can be frustrating when you stand on the weighing machine but the scale did not move. No matter what you want to achieve in life, be it to build a successful business, to be financially free, to lose weight and maintain your fitness, or to travel the world without worry, you can achieve. You can live all your dreams, but you need some guidelines. You need the lighthouse to show you the right direction when you’re lost. You need helpful advice when you are having difficulties in your business. And you need to be inspired whenever you feel inferior. First, to live a successful life, you must identify the success that you want. Without defining the success you want, you’re like embarking on a journey without knowing the destination. You can never reach a destination if you don’t know where you want to go. This is one of the most common reasons people are living in mediocrity. They fail to find out what they want to achieve in their lives. You see, a lot of people spend days and even weeks into planning their holiday trips, but they don’t even spend a few hours to really think about their lives. If you haven’t crafted out your life plan, I strongly suggest you stop doing whatever you’re doing after reading this article and spend some time to really think about what you truly want out of your life. The key is that you want to live an intentional life. You don’t want to fall into the Niagara Syndrome and only to regret when it’s too late to make a change. When you don’t have a plan, you will fall into someone else’s plan. And guess what they have for you? Not much. So make time for planning. If you’re busy, schedule and block out time to find out what you really want in your life. If everything is perfect and happens according to my plan, how will my life look like in the next 10 years? Why do I wake up in the morning and what are the things I’m looking forward to? If money didn’t exist, will I still be doing what I’m doing each day? Knowing yourself is one of the most important factors that will help you live a better life. Thus, define your success. What has to happen in order for you to feel successful? Heard enough about setting goals and making plans? This is exactly what you need to do to achieve the things you want in life. There is no way success will come to you accidentally. You need to “engineered” it. You can’t leave things up to chance. If you want something, you have to make a resolution to achieve it. And then you make plans to achieve it. That’s exactly what happened to most extraordinary people out there. First, they started with a burning desire for what they want. And then they set it as their resolution, create plans, and make conscious decisions to get there. While it is true that planning may not work all the time, but having a plan is better than having no plan at all. When you have a clear goal and a concrete plan of getting the results you want, you have better control of your life. You know exactly what you need to do to get the success that you want. And that’s how people become successful. It is something that they do consciously, not base on sheer luck. The more you plan, the more you are prepared. And the more you prepared yourself, the better your chances to succeed. Having a goal and a plan are just not enough, you need to make progress. And more importantly, you need to focus on your progress. Don’t just think about your goals and your dreams, because if you do and when you are not getting the results you want, you feel dejected. Instead, choose to focus on your progress. The key is to think about what you can do right now and take that one small step that will get you the small victory. If you focus on your goals, which are usually big and far into the future, and when you don’t get the result you desire, you will feel like a failure. 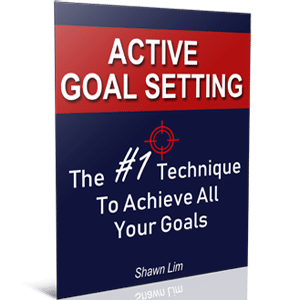 For example, if you set a target to collect 10,000 subscribers by year end, but if only one or two people subscribe to your newsletter today, you will feel too far off from your goals. You will feel frustrated, inferior, and think that you have failed, which is not. Success started small. And this is why you have to focus on making progress. So what do you need to do to get 10,000 subscribers? Perhaps, you need to constantly publish good content on your blog and do the marketing. And when you focus on the progress – build content each day and promote your blog – eventually, the traffic will come and you will get more and more subscribers. That’s how you reach your goal, by making one small progress at a time. Therefore, set goals and make plans, but focus on your daily progress. Keep your eyes on your progress and don’t deviate from your plans. Hence, focus on your progress. There you go, another common tip to be successful in life. I believe that if you want to be successful in whatever you do, you need to inject fun and passion in it. If you look at the world’s most successful people today, you will notice that they are still going to the office and work like everybody else. They can choose to retire and still enjoy a very good life. But they choose not to. The reason is simple – successful people are not doing it for the money, they are doing it for the fun and passion. It is difficult to be successful in life. It is not easy. And because it is tough, any rational person would give up. Only those who are passionate about what they do will continue to do it, even if it is tough. This is why extraordinary people continue to work even when they are rich. They don’t really work for the money. They work because they love it. Without passion, you will give up when you fail. Your passion is what keeps you going when the things get tough. Hence, find the fun and inject the passion into what you do. There is no way you can be successful in life without constantly improving yourself. Whatever you want, you just need to improve yourself to get it. You can’t be successful if you don’t possess any success qualities. Extraordinary result only goes to those who are worthy of it. So, work hard to constantly improve yourself to become the right person that will attract the result you want. And this is why I’m committed to reading every day. Picture this, if you read a book a month, in a year, you will have read 12 books. And in 5 years, you will read at least 60 books. And what if you are trying to build a successful blog like I did. And all the books that you are reading are related to digital marketing, internet marketing, building a better blog, online business, etc? Do you think that after 5 years, you will have a better chance to build a better blog? Do you think that reading gives you an advantage right now where most people don’t read to learn and improve? That’s the power of constant learning and improving. You don’t have to become great to start, you just need to start to be great. Thus, commit to constant and never-ending improvement. When you make it a habit to learn and improve each day, you will still not be successful overnight. But, it does make a big impact on your life after some time down the road. The difference is minor when you first started, but after a few years, the impact on your life will be significant. If you are serious about living a better and more successful life, this is what you need to do. People who don’t raise their standards and don’t push their limits will never get to a new place. They will continue to stay where they are and repeating their last year, this year. I bet you don’t want this to happen, right? So constantly challenge yourself by setting short-term goals that push yourself to a new height. How many times have you told yourself that you should lose weight, work harder, save more money, be more passionate, and be more committed to your goals? And how many times have you failed? You see, the main problem with most people is that they have a dream and they understand that they want to be successful in life, but they don’t truly commit or fully resolved to achieve it. They know that eating junk food is not going to make them healthy, but they continue to do so because they don’t raise their standards. If you want to build a successful blog, you know that you need to constantly create great content and you need to promote your blog, but most people choose not to do it. They’re not serious and they are not 100% committed. As long as you don’t raise your standards and turn your “should” to “must”, you will never be successful. “If you want real change, you have to be willing to do your part. And it starts with asking yourself, honestly, who you are. So stop accepting anything less than what you deserve. It is time to truly commit, to make a real decision, raise your standards, and push your limits. If you don’t, you will continue to be the same. As long as you don’t truly commit, things will never change. One of the most common reasons people fail to get what they want in life is that they lack the persistence and patience. People want success quickly. They want it now. They don’t want to wait for 10 or 20 years only to become successful, they want it right now. And this is why they fail. When you look at the short-term rather than the long-term, you will never produce extraordinary results. Success takes time, my friend. Unless you have the resources, you can’t create extraordinary success overnight. You need time to develop the right characters, to build the right habits, and to grow the right mindsets only then you can get what you want. Most people are impatient and they don’t have the persistence to stick to their plans. This is why you should learn from a bamboo tree. When you plant bamboo, you will never see any significant growth from it in the first 5 years. Even if you nurture it, fertile the soil, water it, and make sure it has the right condition, it just never grows in the first few years. But in the fifth year, the bamboo tree you planted can grow up to 80 feet tall in just 6 weeks. In the first few years, the bamboo is growing its roots deep into the soil. It knows that in order for it to grow tall, it needs to build a strong foundation. In the first few years, the bamboo is actually growing its roots. But it all happens underground and you can’t see it. You think that it is not growing. The same goes in life. When you work, learn, and keep making progress, you think that you are not creating any significant result. But things are working magically within you. You are preparing yourself to become the right person worthy of success. There is no way you can make a change if you’re not willing to do something different and get out of your comfort zone. There is a saying, “growth happens outside of your comfort zone,” and I can’t agree more. The thing is that if you keep doing what you have always done, you will get what you have always got. If you want something different, you need to do it differently. When you change what you do on a daily basis, you will get a different result in the end. Most people get used to their normal life. They do what they always did. And as a result, they are getting the same old results. Unless you change and venture out of your comfort zone, nothing will change. In your comfort zone, there is a sense of security, certainty, and familiarity. But when you step outside of it, you’re taking a risk and there will be the possibility of stress and anxiety. According to this article from Huffington Post, staying in your comfort zone can result in consistent and steady performance, but stepping out of your comfort zone into a new and challenging task can create the conditions for optimal performance. But to really grow, you need to get outside and do something challenging. It is like playing a game, especially a role-playing game. In order to build a stronger character, you need to fight bigger and stronger enemies. If you continue to fight small and little enemies, your character growth will be slow. And it is the same in life. If you want to get to a higher level, you need to level up yourself. And to do this, you need to challenge yourself and get out of your comfort zone. Like traveling to a country that you have never been before. It may seem scary at first, but once you have done it, you gain the experience. The next time you don’t feel scary anymore. You have to treat success in the same way. You must keep challenging yourself and dare to try out new things because that’s how you grow. What if you venture out of your comfort zone and you fail? Well, it doesn’t matter because if you don’t get out of your comfort zone, you fail by default too. Many people are afraid of failure because they believe that failure is something bad. And they think that failure is the opposite of success, which, in my opinion, is totally wrong. Failure is on the same side of success. As long as you don’t quit, you will never fail. You have to make failure as an experience so that you can succeed in the future. You have to transform failure as your stepping stone to success. If you are afraid to fail, highly likely, it is because you treat failure as a person rather than an event. When you try out something and you fail, you are not a failure. It just means that what you did is not working. It is an event, not a person. You’re not a failure unless you look at yourself that way. When you fail, it means that something is not working and you need to change or improve your approach. Like how a baby learns to walk. She will fall many times, but are you going to label her as a failure? Of course not. You don’t look at it that way. You treat it as an independent event and encourage the baby to learn to walk the proper way. But as you grow older, you somehow believe that failure is bad. You think that if you fail at something, you become the failure. No, it is not. Failure is an event. If you fail in your life or even a moment ago, it just means that you need to try it again or improve your method. Therefore, don’t be afraid to fail. You have to fail in order to be successful. Of all the tips to be successful above, I believe that this is fundamental that you must learn and acquire. Nobody can be successful if he or she is negative. Think about it, if you are building a business but you are negative about your business and the market, do you think you can grow it big? I doubt it. If you have a great idea but are gloomy about the future, there is no way you will take action and turn the idea into reality. You will tell yourself things like the market is slow, the economy is tough, there’s too much competition, etc. Being negative holds you from achieving your very best. It creates doubts and prevents you from taking massive action. If you believe the stock market is going to crash, will you still pour in your hard earned money there? No, you won’t. The same goes for achieving great success in life. If you are negative about yourself, your dreams, and your future, you will hold back and do nothing. So start thinking positively. Try to maintain your positive mental attitude no matter how much negative things you have to go through in the journey. Remember, a negative person will find difficulty in every opportunity. And a positive person will find an opportunity in every difficulty. It is true that thinking positive cannot guarantee your success, but without it, it is guaranteed that you will never achieve what you want. In other words, positive thinking is the beginning. It is what gives you hope and opens you to the possibilities. Here’s the bonus tip to success – take action. If you want to produce results and you want to reap great success in your life, you must first put in the hard work. You must sow before you can reap. A lot of people are not willing to do the hard work. And that is why they are not living the life that they want. Take massive and consistent action is the ultimate key to success. Without action from your part, nothing is going to happen. You can’t just dream about what you want and hope that it will come true. You need to do something. And you don’t have to wait. You can start right now and do something. Many people wait. And more people choose to sit and do nothing. Whatever that you want is out there. You just need to be proactive and act. None of the tips above will work unless you put in the work. Being successful is not easy. If it is easy, everyone will be successful. And depending on how you look at it, it can be good news or a bad one. It is good because it means that most people are not successful. And all you need to do is to stick to the tips above and achieve the success that you want. You just need to be more hardworking than others. Think more positive than others. Be more persistent than others. Most people are afraid to venture out of their comfort zone, and if you do it, it will make all the difference. More importantly, people don’t take action, and if you do, you can be one who succeeds. And others will just look at your success and say that you’re lucky. I hope the tips here are going to be helpful to you. So do you think that I left out some other tips that are more important?